The time had come. After 10 years of sailing Cosmic Dancer in European and Atlantic waters we decided it was time to dip her keel in the Pacific for the first time! 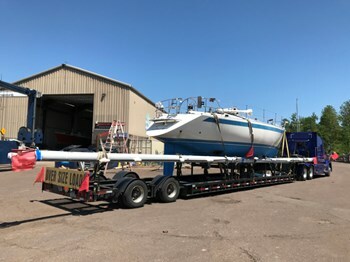 Having spent last season sailing to what prides itself as the Atlantic’s most westerly seagoing port, Duluth in Lake Superior, all that lay between us and the Pacific was a 1,665 mile road journey across Dakota, Montana, Idaho and Washington to Seattle, a mere trifle compared to the 3,000 odd miles we sailed in getting from the outer St Lawrence to Duluth, and an awful lot easier than the alternatives of either a NW passage or a 10,000 mile plus passage via Panama and Hawaii. Preparing a yacht for a long overland journey is not a trivial task and is at least as time consuming as getting ready for a trans ocean passage. Every last piece of rigging and fittings has to be dismantled and packed, whilst anything that cannot can be has have to be padded so that 4 days of road vibration doesn’t end up destroying it. It took us almost 2 weeks of preparation before Cosmic Dancer was ready to roll, with us following behind in a hire car. We had fondly thought that keeping up with the massive truck, almost twice the length of our yacht, would be no competition. We were mistaken. What the truck may have lacked in speed it more than made up for in endurance and we eventually arrived in Seattle some 24 hours after the yacht. In the meantime, we enjoyed 4 wonderful days driving across America, a journey that took us across the headwaters of both the Mississippi and Missouri rivers and into North Dakota where we feasted in a succession of Bratwurst diners that would put all but the very best of German Imbis's to shame, whilst passing the oilfields of North America’s latest oil boom. Although, the subject of many recent environmental protests, we were amazed at how visually low impact these fracking rigs were, and certainly much less intrusive than many land based windfarms. From Dakota, we headed into Montana and many of places that filled the “Wild west” stories of our youth. We passed through the “Badlands” and the site of General Custer’s last stand, followed the mighty Yellowstone river for many miles, and then climbed up into Yellowstone National park over a pass that even in June had enough snow on it to keep the summer skiers occupied for a few hours. We didn’t encounter any cowboys but the Montana hospitality was legendary. Arriving in Seattle was a step change with the wide open plains and relative tranquillity of the mid-west being replaced by a lively and bustling modern city. We are currently putting Cosmic Dancer back together in a boatyard in Ballad, once the working heartland of blue collar Seatlle, but now home to an eclectic mix of leisure boatyards and funky restaurants and bars. We’re not short of work to do on the boat but we’re also not short on places to go and have a beer once the work is done!